Personal and tailored relocation services from local experts. Schooling is one of the most important issues during the relocation process of a family. Our experts support you to master challenges and answer questions regarding your children’s education. Effective communication and networking are at the heart of Connectiv, and they are the reasons we find the best solutions every time. Connectiv Relocation obtained the EuRA Global Quality Seal in 2018. Based on an ISO 9001 process management model, the EuRA Global Quality Seal specifies the processes and KPIs that reflect the very highest standards in relocation services. 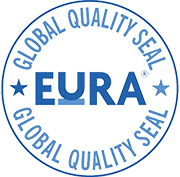 As a member awarded with the EuRA Global Quality Seal, Connectiv Relocation demonstrates a total commitment to quality.